Israeli sensor and data analysis startup Phytech closed an undisclosed Series A round of funding last week after getting commitments from new investor Syngenta Ventures and existing investor Mitsui Co Europe, the trading conglomerate. Phytech’s unique devices monitor individual plants, using the company’s patented phytomonitoring technology. Phytech’s PlantBeat platform combines the data they collect with data from soil moisture and microclimate sensors, and spatial imaging, to give farmers a view of water stress conditions in the field. This data is analyzed using Phytech algorithms and communicated to farmers through their phones or tablets, offering real-time feedback and decision support to help them reduce costs and improve yields, according to its website. Phytech also aims to enable data sharing between farmers and other relevant contributors such as researchers, consultants, suppliers, and consultants, through its cloud-based platform. Syngenta, which is an existing user of Phytech’s sensors on some of its land, was attracted to Phytech for a variety of reasons. 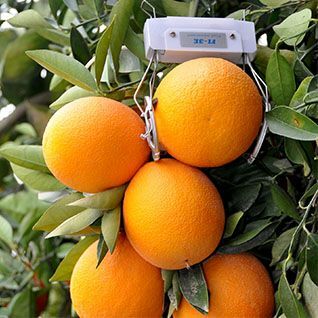 They include its distribution strategy, use of dendrometers (see photo), and its combination of sensor hardware and decision support software, according to Michael Lee, managing director at Syngenta Ventures. Lee was also impressed by Phytech’s commercial collaboration with two crop protection products companies — ADAMA Agricultural Solutions and Nufarm — as part of its go-to-market strategy. Finding a suitable route to market and distribution channel is one of the agtech industry’s biggest challenges that many startups need to solve before they are successful. But Phytech has made some important steps forward with these agreements, argued Lee. Phytech is primarily useful for perennial crops such as fruits and nuts, but it is also being used for cotton production in Israel, according to Lee. While Israel has been Phytech’s “laboratory”, Lee would like to see Phytech used on larger farms globally. Phytech could be more cost efficient on larger farms too, Lee added. The funding will go towards expanding Phytech’s technology platform and supporting continued global commercialization beyond Israel. An IPO or trade sale is the most likely exit route for Phytech, according to Lee, who argues that an acquisition by Syngenta or another seed and chemicals-focused agribusiness would be unlikely to make sense. Syngenta Ventures’ portfolio is split relatively evenly between US and European (inc Israel) agtech investments, according to Lee.